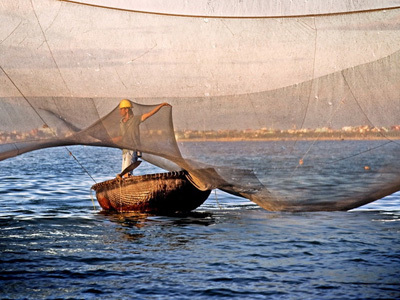 The south of Vietnam enjoys a culture distinctly different from the rest of the country. 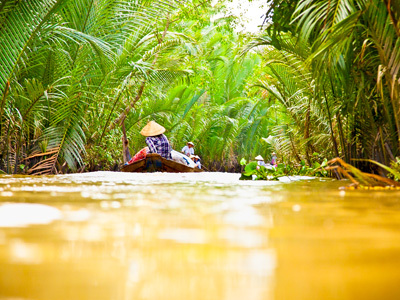 Exploration of the Mekong Delta, from your base in Ho Chi Minh City, offers insight into an agrarian culture that is quickly modernizing, while remaining true to its history. This itinerary also offers a look into contemporary Vietnamese culture with an art tour through galleries in the City, as well as a street food tour. 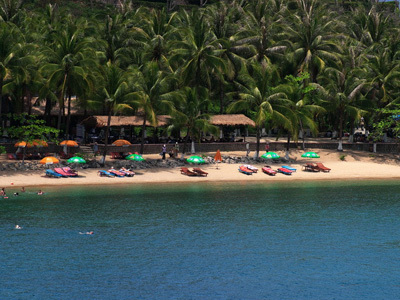 After the cultural education, jet off to Nha Trang to spend a few lazy days snorkeling and lounging on the beach. Welcome to Vietnam! Upon arrival to Ho Chi Minh City – Tan Son Nhat Airport you will be met by your private guide and driver and transferred to your hotel. Check-in and enjoy the rest of the day at leisure. While much of Vietnam is set in its traditions, and content to live life at a slower pace, HCMC is where the nation's urban warriors congregate to work hard and play harder. The city that some still call Saigon has been the driving force leading Vietnam into the 21st century, and the result is a whirlpool of activity that one cannot help but be swept into. Remnants of Vietnam's history pockmark the city, creating a charming contrast of old and new. Today, you will embark on a full day, eight hour private tour of the city with a local guide. 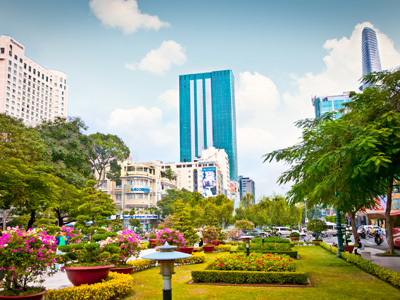 This tour will be a fantastic introduction to Saigon and the chance to get a personal insight, not only into the classic sights, but also into some more unusual and unique features of the city. The day starts with a local coffee and an early morning walk through Tao Dan Park. As a relaxed, shaded location, it is a lovely way to start the day. The sounds of song birds, a local coffee to get you moving and locals starting their daily routine with yoga, tai chi, dancing and much more. From there, it’s a short walk to The Burning Monk Monument, a dedication to the subject of ‘that’ iconic photograph from the Vietnam War. Here, you will stop for a bowl of breakfast soup before heading to Cho Lon, known as the Chinatown of Saigon. Cho Lon is a feast for the eyes. Your guide will lead you through the winding backstreets, describing the daily life of residents and the history of such an iconic area including two unseen buildings that were directly involved in the reunification movement. After escaping from Ho Chi Minh City’s urban sprawl, you will travel to Ben Tre. Enjoy a boat cruise along a tributary of the Mekong, before taking a short walk through various local workshops observing cottage industries. Continue the boat trip to My Long village, walking through the hamlet to see rice paper production and enjoy some rice cake. Following the Cai Son Canal, you'll visit a coconut workshop and see traditional processing before stopping at a bee garden to enjoy some fruit and honey tea to the sounds of local music. Visit a candy mill and visit a farmer who makes sleeping mats. Bike on rural tracks or take a Xe Loi (motorized rickshaw) through coconut groves, diverse vegetable patches, and jump back on the boat to reach Green Garden Riverside restaurant for lunch. After the tour, you'll be taken to your hotel to relax for the evening. Today after breakfast, you will be met by your guide at your hotel and start the day with a visit to Van Rau Pagoda. Take time to learn about the importance of Buddhism in the Khmer community, visit a Khmer village to chat with local people and see their traditional crafts, including brocade and silk. Continue to Tra Su Forest for a boat ride, enjoying the natural sights and wildlife viewing. Take a short coffee break, rest in a hammock, and climb up to the observation post to enjoy the views of the mountains and mangrove forests. Afterwards, you'll continue to Phnompi Khmer Village for a delicious local lunch, before visiting the ancient Khmer Pagoda to see the beautiful old Banyan trees and the monks in their daily routines. After a full day of exploration, you'll be transferred to your hotel to enjoy the rest of the day free at leisure. 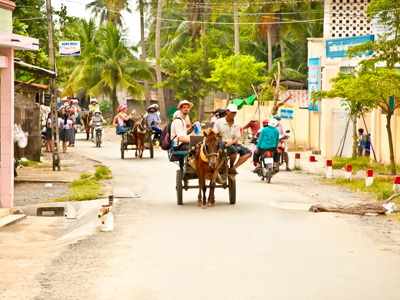 This morning after breakfast you will be transferred to your hotel in Can Tho. Check in and have a rest before your afternoon tour. This afternoon, your guide will pick you up from your hotel and take you to the countryside for your village bike tour. Visit a local noodle house, before weaving in and out of untouched peaceful villages, tropical orchards, and countryside roads. Stop by the many "monkey bridges" and small canals. Then, visit an organic cacao farm and learn about production before tasting some cacao wine. Afterwards, return to your hotel for a relaxing evening. After an early breakfast we will board our local boats to visit the Cai Rang Floating Market, the most famous floating market of the Mekong Delta. Enjoy the beautiful scenery and the bustling activity of the market. We will further venture through small canals visiting a rice husking mill and a shop where rice noodles are being produced. At noon, we will have lunch at a local restaurant on own. When the tour finishes, you will head towards Ho Chi Minh City where you will have the rest of the evening free at your leisure. The tour will start when your tour guide meets you at a place specified by you at 5:30pm. Each of our guests receives a friendly personal English speaking tour guide who is both licensed and trained. You will then be given safety instructions on how to ride on the back of a bike properly in order to ensure the safest experience. The first part of the tour features three diverse street vendors where you will get to sample some of the many foods that they offer and learn about the history and cultural significance of each dish. Your guide will explain the many different sights that you will pass along the way as we travel to the different street vendors spread throughout Saigon. We will then take you to a night market where you will have a chance to sample more foods and snacks as well as the many exotic fruits found in Vietnam. Your personal tour guide will also assist you with any purchases you wish to make. 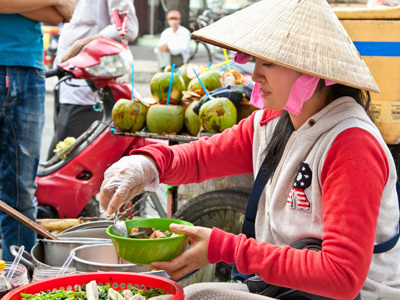 Our tour ends with one the most popular Vietnamese food traditions; “The Street Barbeque.” Here you will get a chance to gorge yourself on as many different kinds of foods as you can eat. As long as you keep eating, we will keep ordering. In addition, you will have the option of sampling some of Vietnam’s famous rice wine including snake wine, ginseng wine and goat wine. At the end of the night (around 22pm) when you have eaten your fill we will drop you back at your hotel. Our tour is designed to give you a taste of as many different kinds of food as possible and is suitable for all travelers to Vietnam. After breakfast, you will be free at your own leisure until your driver picks you up and transfers you to Tan Son Nhat Airport for your flight to Nha Trang. Upon arrival, you will be transferred to hotel for check-in and enjoy the rest of day free at leisure. Nha Trang's tropical days flow directly into party fueled nights, and the cycle continues through most of the year. A gentle ridge of hills frames a crystal blue bay, and the resorts, restaurants, bars spas and shops are sprinkled throughout. 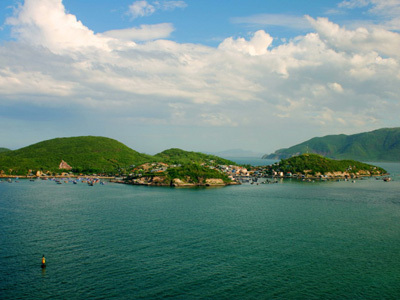 Whereas the rest of your trip to Vietnam can still be an adventure, Nha Trang is your chance to enjoy a laid back vacation in every sense of the word. At 8am, your guide and driver will pick you up and they will transfer you to Cau Da Port, where your journey visiting beautiful islands in Nha Trang Bay will start. First, we will visit Mun Island where we will do some snorkeling on the amazing coral reefs covered with multicolored fishes. We will then explore Mot Island where we will also snorkel for a while. You can also do some fishing with the crew or relax on board. At noon we will stop at Con Se Tre Island where we will explore the village and have lunch. After relaxing for a while in the beach, we will start heading to Tri Nguyen Aquarium where you will be able to learn about the life of marine creatures under water. Around 4pm, we will start heading back to the pier and you will be then transfer to your hotel. Enjoy this free day at your leisure. Although your Vietnam adventure must come to an end today, you will be leaving with new friends, amazing experiences and memories to cherish for the rest of your life. Once you have checked out of your hotel in Nha Trang, you will be met by your driver and transferred to the airport in good time to board your international departure flight. Villa Song Saigon is a lovely boutique hotel with 23 unique, luxuriously appointed rooms and suites, located along the banks of the Saigon River. No two rooms on property are the same. Suitable for romantic getaways, solo explorations and family adventures alike, the hotel has something to offer any traveler. Start your journey with complete relaxation in your comfortable guest room, or rejuvenate in the in house Spa with a variety of hotel and spa packages available. Later, enjoy eclectic food and beverage options with all day dining at Bistro Song Vie for your candlelit dinner, or sip on classic cocktails at the riverside bar and wine cellar, all coupled with a stunning view of the Saigon River! Walking through the doors of The Myst Dong Khoi, you enter a timeless space. The Myst Dong Khoi inhabits tree-lined H? Hu?n Nghi?p Street, near the gently flowing waters of the Sông Sài Gòn, and steps from famous ? ?ng Kh?i Street – the fashionable commercial heart of Saigon since colonial times. You’re free to meander along the riverfront, or head to the Opera House, to Notre-Dame Cathedral or to Independence Palace. Or heed the call of Nguy?n Hu? Walking Street with all its bars and boutiques. 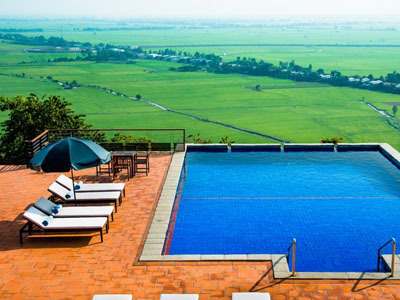 Located right on Sam Mountain, Victoria Nui Sam Lodge is located about 7 km from Chau Doc Market and Chau Doc River, which offers accessibility to Cambodia’s Phnom Penh. Rooms feature canopy beds, cool tile floors and wooden furnishings. They are equipped with cable TV, a minibar and coffee/tea making amenities. Victoria Nui Sam Lodge houses an outdoor swimming pool surrounded by the spectacular natural landscape. It offers free wired internet access in rooms and free Wi-Fi access in its public areas. 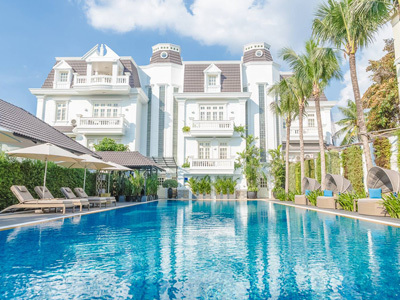 The only luxury hotel in the center of the Mekong Delta, the Victoria Can Tho Resort blends colonial-style architecture with the natural beauty of the river. Close to Can Tho town, but a quiet retreat from the hustle and bustle of the city, the resort lies on the banks of the Hau River, set amidst gardens with a plethora of exotic plants. The Victoria Can Tho Resort features 92 rooms, including 8 luxurious suites, all designed with wood flooring, authentic Vietnamese decoration and balconies offering spectacular views of the river, pool or of the garden. Each room combines the elegance of traditional artefacts and the comfort of an international standard hotel. 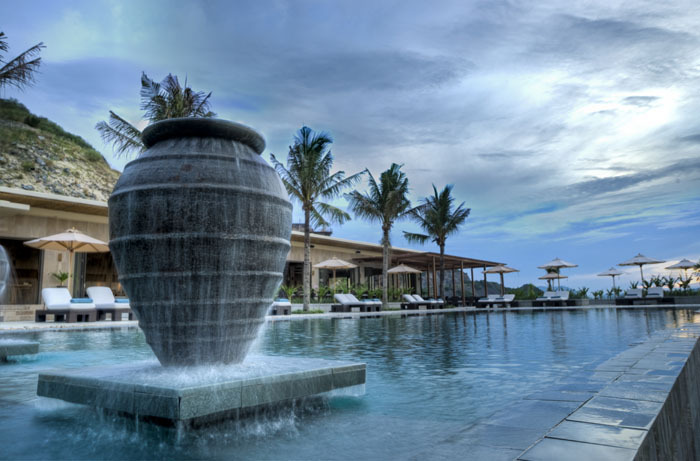 Nestled in the mountain pass between Cam Ranh Airport and Nha Trang, on the slopes surrounded by pristine aquamarine waters, lies the beautiful Mia Nha Trang resort. Powdery white beaches and crystal clear water lap the private beach that the resort is set on. Indigenous gardens filled with the scent of frangipani mixed with fresh sea air make for a rejuvenating experience. Based on eco-friendly principles, Mia boasts rooftops studded with manicured grass and shrubs instead of tiles or differing roof coverings, enhancing the environmental appeal. This is just one of many authentic travel experiences offered by Global Basecamps. 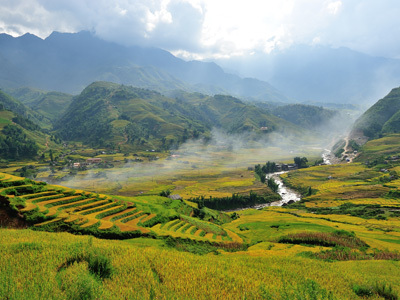 If you are interested in more unique destinations to Vietnam with unprecedented planning and extraordinary service visit our main Vietnam tours page to browse other sample trips.